WASHINGTON - A sharply divided US Supreme Court ruled yesterday in favor of a group of white firefighters who accused the city of New Haven of racial discrimination, potentially making it much harder for employers to bring racial balance to the workplace, while handing ammunition to critics of high court nominee Sonia Sotomayor on the eve of her confirmation hearings. The 5-to-4 ruling struck down the decision of a three-judge federal appeals court panel that included Sotomayor, President Obama’s first Supreme Court pick and the first Latino chosen to serve on the nation’s highest court. Since her nomination, conservative Republicans have attacked Sotomayor’s views on racial preferences and stirring up hot-button questions about whether diversity and background should be considered for a lifetime judicial appointment. If confirmed, Sotomayor would replace retiring Justice David Souter, who agreed with her and sided with New Haven in the case. Conservative legal analysts were quick to link the ruling, issued on the last day of the court’s session, to Sotomayor. “It suggests that we have somebody who’s quite out of sync with the right approach to the law in this area,’’ said Roger Clegg, who heads the Center for Equal Opportunity, a conservative think tank. At the same time, legal analysts said the court’s decision dramatically shifts the affirmative action landscape. Opponents of race-based preferences cheered the ruling as a major step toward a society that doesn’t place significance on color, while supporters said the majority ignored the ongoing need for remedies to past discrimination, virtually wiping out advances made over the last quarter century. Although New Haven had tried to make its promotion examination race-neutral, too many whites and Latinos and too few African Americans met the standard for promotion. The city, worried that it would be sued by black firefighters, voided exam results and did not promote any of the white firefighters, even though they scored high enough to advance. But the firefighters cried foul, arguing in a lawsuit that New Haven’s decision to start from scratch was a race-based act of discrimination against them. The city, however, contended that the firefighters were not harmed because no one got a promotion and that the test results had a disproportionate affect on black firefighters, a violation of civil rights law. Though city officials argued they had followed Title VII - and Sotomayor, as part of a three-judge appeals panel agreed -- the Supreme Court saw it differently. The court’s conservative majority found that New Haven broke the law when it weighed the test results in a way that made race an asset for blacks and a liability for whites and Latinos. Besides Roberts, Justices Samuel Alito, Antonin Scalia, and Clarence Thomas all joined Kennedy, the swing vote on many issues, on the opinion. But in a stinging dissent, Justice Ruth Bader Ginsburg said while the white firefighters “understandably attract this court’s sympathy . . . they had no vested right to promotion’’ and are not victims of discrimination because no one was promoted at their expense. The balance of the court’s liberal wing - Justices Stephen Breyer, John Paul Stevens, and Souter - joined Ginsburg’s opinion. White House spokesman Robert Gibbs said yesterday that the high court’s ruling will not hurt Sotomayor’s nomination, which enters a new phase with the start of confirmation hearings before the Senate Judiciary Committee on July 13. Gibbs highlighted Ginsburg’s dissent, which backed Sotomayor’s decision, asserting that it showed that the conservative majority was delving into judicial activism, a key talking point Republicans often bring up when discussing Democratic judicial nominations. Sotomayor, Gibbs said, was following past rulings when she helped decide the New Haven case. In New Haven, Mayor John DeStefano Jr. said the Supreme Court’s rulings in antidiscrimination cases are straying too far from “reasonable and time-tested efforts’’ at workplace diversity, the Associated Press reported. 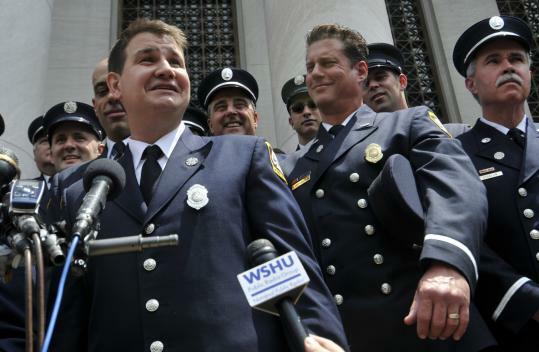 Nevertheless, Vladeck of American University said the ruling creates a no-win situation for employers like the city of New Haven, which probably would have been sued by the black firefighters if the test results had been certified. “The question is, which lawsuit would you rather face?’’ he said.